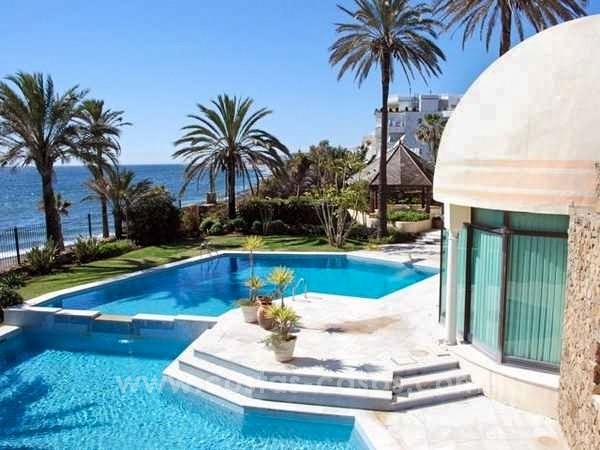 Front Line Beach Palace for sale on The Golden Mile, Marbella Set on a very large plot of 4.400m2 with an extensive beach front, this front line beach property is located on the Golden Mile, between Puerto Banús and Marbella. Located within walking distance to Puerto Banús and all the amenities that come with it this property is prime investment opportunity as there is a shortage of beachfront properties. By renovating or building from scratch you can double your investment. It is a rare beachfront location set for a unique entertainment lifestyle. 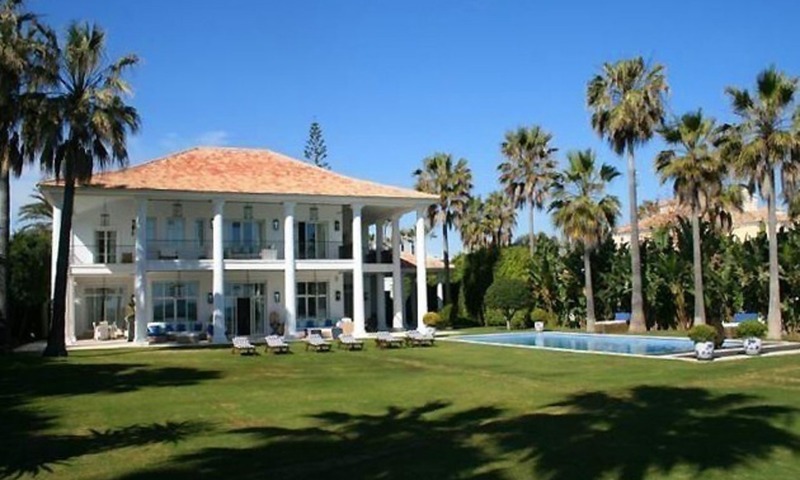 Beachfront luxury villa for sale in Marbella. Discreet sale - sole agent. Frontline beach property on a more than 4.000m2 plot. Almost 2.000m2 built. 6 bedrooms en suite plus staff quarters. Entertainment area in semi-basement. Laundry room. Andalusian patio. Spacious covered and open terraces with Jacuzzi. Pristine condition. Good wide beach in front. Tranquil location. Unobstructed breathtaking sea views. The house as an inviting distribution with well proportioned bright rooms with sea view from most of them. Large lovely garden with large swimming pool and Jacuzzi. This whole beachfront property breaths a pleasant Mediterranean style and atmosphere. Price guide line: 18 million € Viewings only after appointment with Costas & Casas. References required. Frontline beach Balinese style villa for sale in the East of Marbella Front line beach living at its best! The villa features very spacious rooms, multiple external entertainment areas, a Balinese themed tropical garden with thatched gazebo, 2 superb pools and a large flat garden area edging onto one of the best beaches in the Marbella area, covered BBQ/dining area and seating areas overlooking the Mediterranean sea. 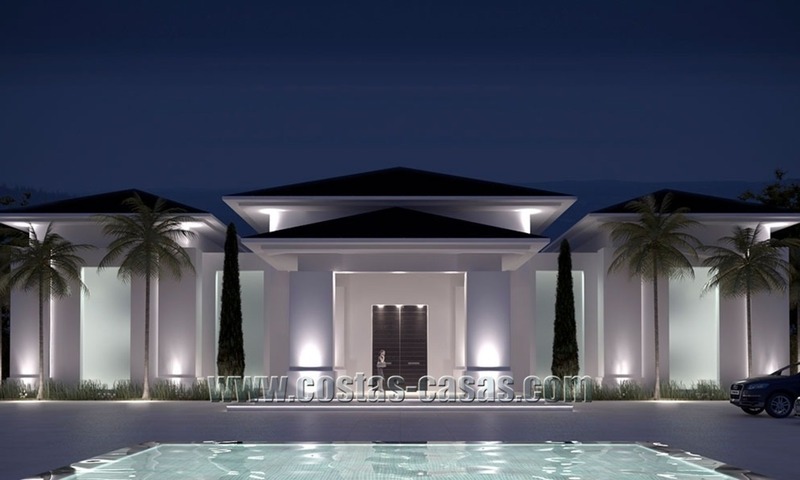 The villa has parking space for more than 3 cars and a garage. The exclusive community benefits from a 24h gated security service. Grand Villa property for sale, La Zagaleta, Marbella - Benahavis at the Costa del Sol, Southern Spain. This luxurious villa is located in the most exclusive private Country Club in Europe, La Zagaleta in the Marbella - Benahavis area. Beachfront luxury villa to buy, Marbella Frontline beach villa for sale on a large plot of almost 3.000m2 Recently built. 5 bedrooms, 5 bathrooms, staff quarters Lounge, dining room, tv room.